Few things are more painful than being stuck in a moving vehicle with people who you find annoying. That’s exactly how I felt watching Tammy, a movie that puts Melissa McCarthy and Susan Sarandon on the road. Painfully misguided, Tammy is the result of a collaboration between McCarthy and her husband Ben Falcone, who co-wrote the screenplay with McCarthy and who also handled the directing chores. Tammy finds McCarthy playing the title character, the wayward granddaughter of an aging alcoholic (Sarandon). After being fired from her job at a fast-food franchise, McCarthy’s Tammy sets out on a road trip with her grandmother, who supplies the car — an aging Cadillac — and the money that supports a journey toward Niagara Falls, a stop on grandma’s bucket list. All of this takes place over the objections of Tammy’s mother (Allison Janney), who understands that grandma is both a diabetic and a drunk, and shouldn’t be let loose on an unsuspecting world. Sarandon may be game for anything, but she’s given scenes that struck me as embarrassing: carrying on in the backseat of a car with a guy (Cary Cole) she meets in a bar or having a drunken outburst at a Fourth of July party thrown by her lesbian cousin (Kathy Bates). McCarthy’s luckier: Her previous comic roles have immunized her against embarrassment. Here, she plays a foul-mouthed woman whose husband (Nat Faxon) is having an affair with a neighbor (Toni Collette). 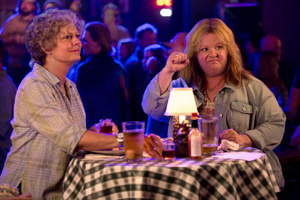 As is the case with many crude comedies, Tammy feels the need to sentimentalize its main character before it’s done, something like a boisterous drunk who ends the evening crying in his beer. Tammy ‘s told — via lame dialogue Bates delivers with unnecessary conviction — that she needs to take control of her life and stop wallowing in self-pity. Sarandon has been made to look as old as possible, even to the point of donning artificially swollen ankles, but she’s never convincingly dissolute. In what may have been intended as a comic high point, Tammy puts a paper bag on her head and robs a fast-food outlet after fashioning another paper bag into a pretend revolver. She needs money to bail grandma out of jail. If this was intended as the movie’s comic high point, it’s not much of one. Mark Duplass plays the son of the man who picked up grandma in a bar and a potential love interest for Tammy, the movie’s lone representative of normalcy. Tammy tries to get by making lame jokes about old folks, dishing out crude humor and toying with the image McCarthy has created in previous comedies such as Identity Thief, The Heat and, of course, in Bridesmaids, the movie that provided her with a breakthrough role. Maybe because it’s summer, Tammy even finds an excuse to blow up grandma’s car. If only that had happened before grandma and Tammy had had a chance to get into it.